At Ascot Splicing we offer a world class range of Rope Ladders and Wire Rope Ladders, manufactured to your requirements where the end results are of the highest quality. With over 25 years of experience within the rope and rigging industry, Ascot Splicing produces Rope Ladders of the highest quality. Generally made from 12mm synthetic fibre rope, our rope ladders are sought after from many industry sectors even including the movies; where Ascot Splicing made a number of rope ladders for the movie, Journey to the Centre of the Earth. Using 32mm diameter round hardwood dowel with a length of 400mm you will find these more than adequate for whatever your application needs may be. 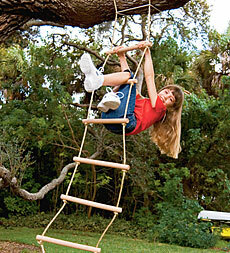 Rope ladders can be used for a variety of different applications, from residential to commercial. Since they are lightweight and take up very little space, they can be transported in a small storage area, and easy to set up. They are also used for many training ground obstacle courses, because they can help develop hand eye coordination and endurance skills. Naval ships have been using them for years as a way to rescue people who have gone overboard. One of the best uses for a rope ladder is for emergency situations. If you live on the upper floors of an apartment building, or have a bedroom on the second floor of a house, they can be used as a means of escape during a fire. They can be stored away until used, and are easy to set up. Made to order, Rope Ladders are very durable and hard wearing and will last for many years. They come in standard lengths 6m, 9m or 15m. Non standard lengths can be made to order. Both ends of the ladders are fitted with 'C' clips so that they can be easily joined to make any required length. Each ladder is normally supplied with a 'Trace.' 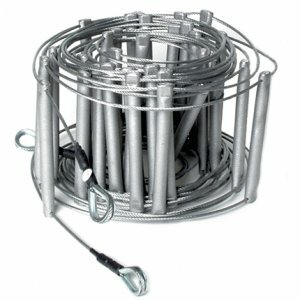 This is 2.5m length of wire also fitted with 'C' clips and may be used for attaching the ladder to a tree, post or structure. The wire rope is galvanised and the rungs are of aluminium alloy therefore corrosion is not a problem in normal environments. Occasional wetting with fresh water will do the ladder no harm. For marine useage or corrosive environments, the ladders can be made from stainless steel on order. The narrow width of the ladder (150mm) actually makes it easier to climb. It enables the climber to keep their body close to the ladder in a near upright position, thus minimising strain on the arms. The rungs are swaged directly to the wire. This provides a very reliable fastening.